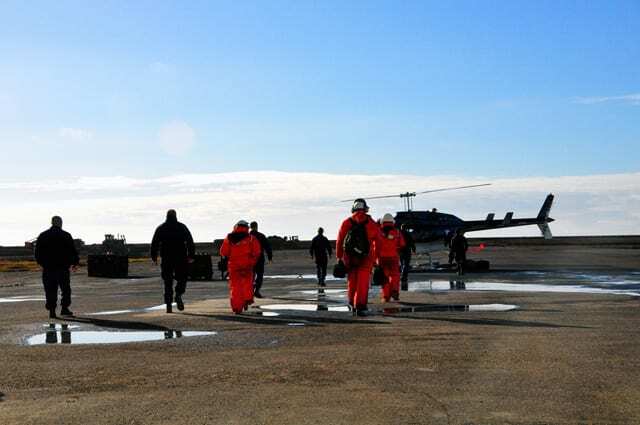 Chief Scientist Bob Pickart and his 26-member science team were in the hangar at the Barrow Air Search and Rescue Station, waiting for the helicopter. An Inupiat community barnacled to a rocky beach at the northern tip of the North Slope of Alaska, Barrow is the most practical departure point for research cruises into the Chukchi and Beaufort Seas. But Barrow has no harbor, which is why we needed an airlift to reach the research vessel, the U.S. Coast Guard icebreaker Healy, anchored two miles off shore. Pickart was anxious, though you had to know him to notice it. In addition to his science team, there were several Coasties, as Coast Guard crew are familiarly called, joining the ship for the first time, as well as piles of personal gear, crated oceanographic instruments, and high-stacked pallets of food—this would be a major production, and that’s assuming it got off the ground. The weather was holding fair, but Pickart has been to Barrow before; he knows how quickly fair weather turns foul 350 miles above the Arctic Circle. Pickart, a physical oceanographer at Woods Hole Oceanographic Institution (WHOI), was chief scientist of this expedition in the summer of 2010. Its purpose was to measure the Western Arctic Boundary Current, or WABC. As water from the Pacific flows northward through the Bering Strait into the Chukchi Sea, it encounters two deep submarine canyons, called Barrow and Herald Canyons, and splits into separate streams. When these reunite, they form the Western Arctic Boundary Current, which proceeds eastward along the coast of Alaska’s Beaufort Sea. It hugs the shelf break, where the continental shelf starts to slope steeply into the abyss, and presses by some unknown route through the maze of Arctic islands in northern Canada. While Pickart longs someday to follow the current through that archipelago, this expedition focused on the stretch between the WABC’s point of origin near Barrow Canyon, along the northern Alaskan coast, to the Mackenzie River delta just over the Canadian border. Compared to other major ocean currents, the Western Arctic Boundary Current is “only a trickle,” as Pickart puts it, but its size belies its significance. The WABC is vital to regional ecology because it influences the melting and production of sea ice and transports nutrients that fertilize the seasonal plankton blooms on which the whole chain of Arctic life depends. Funded by the Office of Naval Research from 2002 to 2004, Pickart maintained an array of moorings athwart the current near 152degrees west longitude. After parsing the data recorded by instruments on them, he determined that a single strategically sited mooring could replace the array for long-term monitoring purposes. 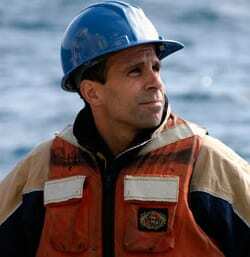 He returned to deploy a mooring in 2005-06 with funding from the WHOI Ocean and Climate Change Institute and again in 2008-09, funded by the National Ocean Partnership Program. The National Science Foundation (NSF) subsequently funded maintenance of the mooring from 2009 through 2013. The specific purpose of this cruise, then, was to collect the data from “Bob’s mooring” and redeploy it. These Western Arctic waters have been largely unmeasured mainly because they remain frozen for most of the year. 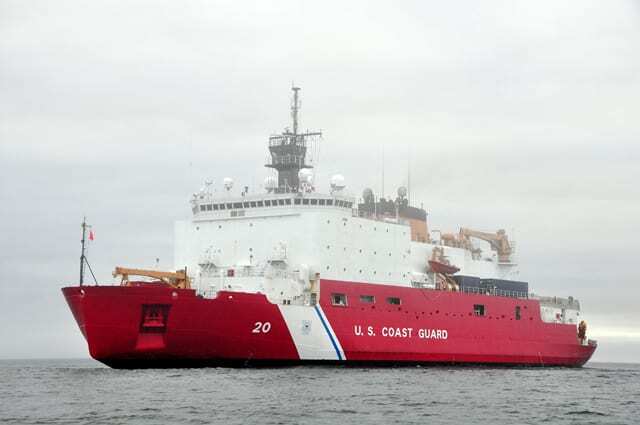 Ocean research requires an icebreaker, but the Healy is the only U.S. icebreaker available. Therefore, ship time is exceedingly precious, and when it’s granted, scientists from a range of disciplines take note. Pickart, as the expedition’s chief scientist, received a flood of requests from western-Arctic specialists to piggyback their projects onto his. He was glad to accommodate as many as possible, but doing so would require additional ship time. When the NSF scheduled it without hesitation, Pickart’s oceanographic cruise swelled into a multidisciplinary expedition to understand the multilayered factors and feedbacks at work in the Arctic air-ice-ocean system. That’s why there were 26 members in his science team, including two marine-mammal acousticians, a sea-bird observer, three chemical oceanographers, another physical oceanographer from WHOI studying small-scale turbulence, a sea-ice analyst, a larger-than-usual public outreach contingent, and John Kemp’s team of WHOI mooring technicians who would execute the various individual projects. The Coasties skillfully handled flight operations and guided us to our cabins with courteous efficiency. But we could empathize if this crew, at sea in the Arctic without a break for three months, was happier for the arrival of fresh stores than a fresh, excited science party. (That night in the mess, devouring a Caesar salad, a petty officer said, “It feels like Christmas.”) The airlift was complete by late afternoon—just before helicopter-grounding fog rolled in. We were under way by dark, while some of us were still wandering hopelessly lost in identical corridors on five different decks. There’s a recurring rhythm to long research cruises. It begins with a flurry of individual activity as people prepare their instruments, but more so this time because we had so many instruments to deploy. Craig McNeil from the University of Washington had brought a prototype device to measure the ocean’s uptake of carbon dioxide from the atmosphere. Using various acoustic devices, Josh Jones from Scripps Institution of Oceanography and Sharon Nieukirk from Oregon State University meant to catalog the number and identity of local marine-mammal populations by recording their sounds. Chemists were setting up their esoteric gear in the wet lab. On the transom, where fine-tolerance measurement meets heavy industry, the WHOI mooring team was moving bins of hardware, anchors, and 2,000-pound flotation balls into position, spooling miles of oceanographic wire, and planning the order by which everyone’s instruments would be deployed. Meanwhile, Brian Hoover, working for the U.S. Department of Fish and Wildlife, had assumed his trip-long position on the bridge from which he would count and identify every bird passing within a 300-meter arc around Healy’s portside. Our first stop, following a 30-hour voyage, illustrated an ever-looming uncertainty in ocean research. Almost exactly a year earlier, Jones’s team had placed three high-frequency acoustic recording devices (HARPs) on the bottom of the sea to compile underwater sounds over a full year. The central ecological events in the Arctic are the fall freeze-up and spring retreat of ice, and the HARPs recorded the annual ice cycle to afford an environmental context for marine-mammal sounds. Each HARP was attached to an anchor by an acoustic release. Upon receipt of an acoustic signal from the “deck box” aboard ship, the release is designed to relinquish its grip on the anchor, allowing a flotation jacket to bring the instrument to the surface. There is always a moment of tension while the technician signals the release and the owner of the instrument stands around pretending to be calm. This time the release obeyed and signaled that it had done so—but the HARP did not float to the surface. Spotters climbed up to the bridge where they could see ten miles to the horizon. But there was nothing to see except empty ocean. “Probably stuck in the mud,” pronounced John Kemp. Pickart’s mooring had also been collecting data about the Western Arctic Boundary Current for a full year. 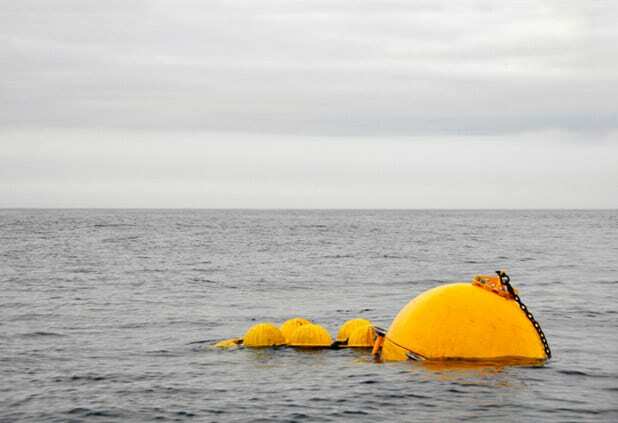 Typical of the genre, the mooring consists, from bottom to top, of a heavy anchor, an acoustic release, and a long wire held vertically in the water column by a 2,000-pound float at the upper end. Onto this basic foundation, scientists can attach a variety of instruments to the wire. Pickart had selected a “moored profiler.” Invented by WHOI scientists and engineers, this clever device consists of a pod of sensors measuring temperature, salinity, and nutrient content that automatically chugs up and down the wire by means of a small traction motor, thereby repeatedly “profiling” the water from near the bottom to the top float. 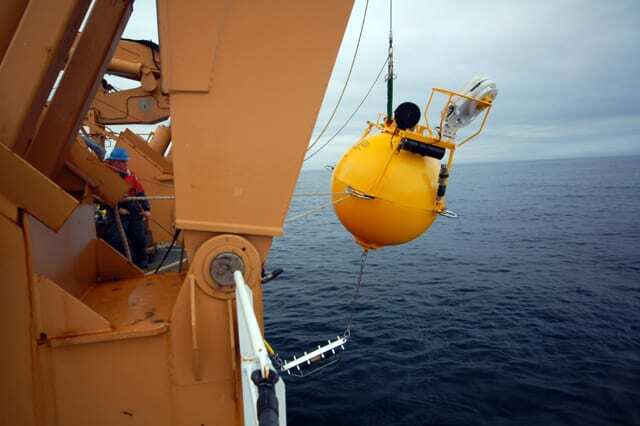 A small, buoyant package of sensors is mounted on the top float. Once a day the package is allowed to rise on a tether to either the surface or the bottom of the ice pack. If the package comes in contact with ice, the tether will go slack, and that signals the winch to withdraw the instrument from harm’s way. At the end of each round-trip, data are transferred to a built-in recorder, thus ensuring that at least some of the data will be preserved should the package come to grief in the ice. We arrived on station to retrieve Pickart’s mooring in rain and dreary fog. The acoustic release obeyed Kemp’s signal, and the big yellow float popped to the surface close to the starboard side. Before technicians got a hook on it, you could clearly see that the winch was missing. Disappointed of course, Pickart wasn’t particularly surprised; the winch travels in a very dangerous neighborhood. But once the entire mooring came aboard, he found to his relief that 11 months of data were intact. He and Kemp’s team installed a spare winch, and reset the mooring until next year. They made it look easy. 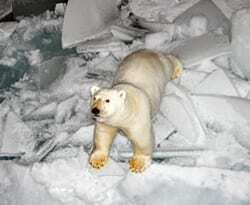 Many physical and biological processes in the Arctic begin with and proceed from sea ice. And so each individual project performed aboard Healy related at least indirectly to ice. Consider the physical oceanography. The WABC tends to hug the continental shelf break. However, because the current is inherently unstable, it tends to spin off eddies, spreading its seasonally cold and relatively fresh water into the Arctic Basin. 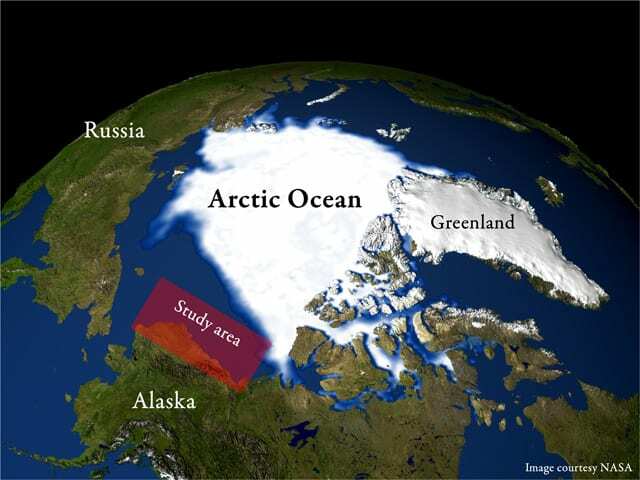 Because its salinity is low, WABC water is relatively buoyant and rides atop a great, largely quiescent pool of warmer, salty water that entered the Arctic from the Atlantic and settled (due to the “weight” of the salt) in the deep portion of the ocean basin. Thus the WABC provides a layer of water that helps to insulate the surface sea ice from the warmer lower layer, which would quickly melt the ice if it came in contact with it. Phytoplankton blooms—those seasonal explosions of life that feed the entire Arctic—depend directly on ice. The process by which they bloom superbly illustrates the interconnectedness of nature’s constituents in these cold seas. Phytoplankton are plants, so they need two things to live: nutrients (fertilizer) and sunlight. There are plenty of nutrients in a rich soup of phosphates, nitrates, and iron lying on the bottom of the continental shelf, where they are of no use to plants that need sunlight to grow. As the winter sea freezes, the salt leaches out of the ice, forming a briny layer of dense (heavy) water beneath the pack ice. When the briny water sinks, it stirs up the nutrient-rich bottom water, driving it closer to the surface. Now only sunlight is needed. It arrives with the spring thaw. When the ice retreats and exposes the newly open water to intense sunlight, a riot of plant life explodes. Copepods and other zooplankton come to graze. Predator plankton arrive to eat the grazers, then fish to eat the predators, seals the fish, polar bears the seals, and Arctic foxes to scavenge the leftovers. Whales arrive to partake of the bounty. Nutrient-rich water can reach the surface by other means as well, but ice is a significant participant in the mixing process that produces this high-power plankton bloom so vital to the chain of life in the Arctic. That gives a dark subtext to this and all other Arctic research cruises today. The ice is vanishing. In a presentation to the crew and scientists aboard Healy during an earlier cruise in these waters, co-chief scientist Don Perovich, from the U.S. Army Cold Regions Research and Engineering Lab, succinctly illustrated the alarming extent and rate of loss: In 1980, the Arctic ice cap—the region of the Arctic Ocean that remains perpetually frozen—covered 7.8 million square kilometers. In 2007, it covered 4.2 million square kilometers. This represents a loss of ice comparable in area to the United States east of the Mississippi plus the row of states directly west of the river. 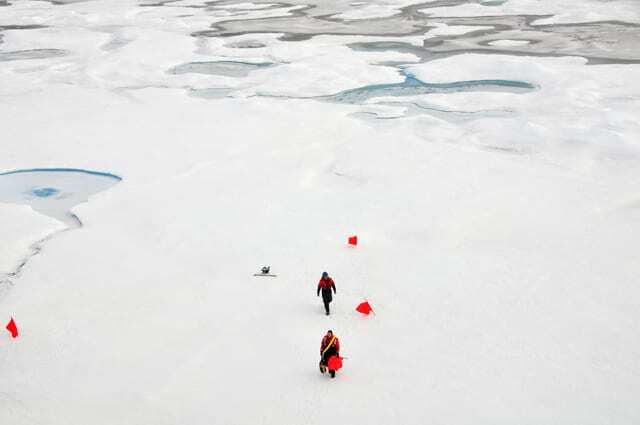 The National Snow & Ice Data Center stated baldly, “Sea ice is in decline in all months, and the rate of decline is greater and faster than natural causes can account for.” The melting is tearing the heart out of the Arctic. Pickart had commissioned a portable meteorological station that would automatically report its findings via satellites to shoreside computers for a year or more. 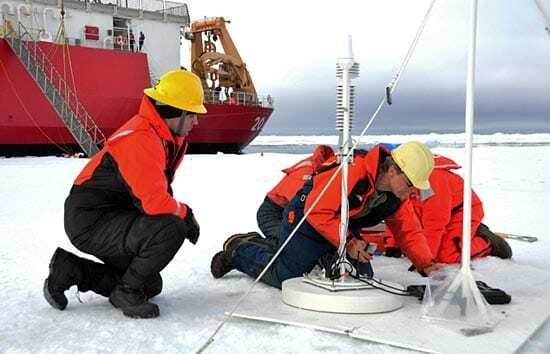 The idea was to plant the station on an ice floe that would, when freeze-up was complete, be positioned near Pickart’s mooring, thus supplying atmospheric data to complement the oceanographic data. Viewing satellite imagery, technician Steve Roberts had been searching intently since day one of the cruise for a multiyear-ice floe that could reliably support the met station. With only a couple of research days remaining, we finally entered a large ice field, and Healy went to work on what Captain Rall had called its secondary purpose—breaking ice. For those of us new to icebreakers, the nighttime lurches, shudders, thunks, and scrapes were initially alarming. During the day, fascinated, we watched the ship cut a path through thick ice cover, and word got around that the team had found a suitable floe. We’d be there tomorrow. That night, about 0300, a polar bear ambled up to the ship, examined the length of her portside, and stood on its hind legs to peer inquisitively over the transom impervious to dozens of cameras flashing in its face. Come dawn, as Healy edged closer to our floe, we saw two more bears hopping over the low ice ridges in the distance. Before the techs were allowed onto the ice to plant the met station, safety divers went over the side to test the ice and mark a safe area with red flags, while a heavily armed bear guard covered them from the flight deck. John Kemp and Frank Bahr quickly installed the station and determined that it was successfully transmitting data. The ship emptied (except for a skeleton watch and the bear guard). Broken floes pocked with turquoise melt ponds; unduplicated patterns of cracks and fissures stretching from horizon to horizon under sparkling blue skies; the massive red ship in bright sunlight; about 80 of its people all smiles in colorful hats and coats; a pickup football game on this frozen hunk of the Beaufort Sea: It was an exquisite, unforgettable sight. During the final 24 hours of research, Pickart followed the Western Arctic Boundary Current into Amundsen Gulf, a western gateway to the Canadian Archipelago, identifying the current by its temperature/salinity fingerprint. It must have been tantalizing. He knows that WABC water reappears northeast of Greenland to influence the circulation in the North Atlantic. But understanding its course through the archipelago will have to wait. We turned west, to begin a four-day trip back through the Bering Sea to Dutch Harbor, Alaska, and the end of the cruise. Then, barely a day later, the met station stopped transmitting. The old hands were sure they knew why: bear. We could picture the bear’s approach, perhaps attracted by all those potential members of the food chain recently on ice liberty, the cautious exploratory sniff before it begins batting the met station around like a toy, reducing it to junk. The Arctic has always been a difficult place to work because of its remoteness, uncooperative weather, the ice, and even the potential destruction of instruments by one of the animals most threatened by habitat loss caused by climate change. But Pickart and the Healy will be back next year and the two after that. 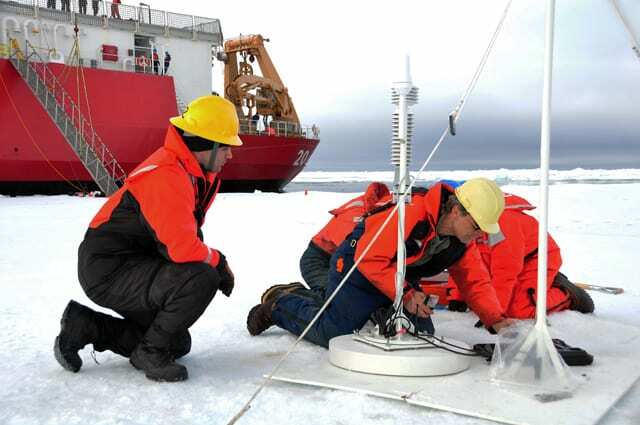 When the long-term measurements of the WABC are complete, he and his collaborators from the range of natural sciences will have established a benchmark regional survey of ocean-ice-atmosphere interaction at this time of radical change, perhaps on the sad cusp of an Arctic that is ice-free in summer. An article on the Arctic winch by Robert Pickart in Oceanus magazine.